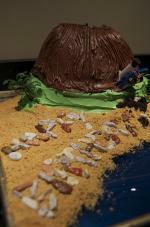 Volcano cakes are an ideal crossover dessert, exciting and fun to both kids and adults. Kids love them because of the novelty factor, not to mention the cascading flames that you can cause to flood out the top of the cakes with a few strategically placed candles. Adults appreciate them because they're something different, they taste great, and they're so much fun to decorate. There are a few different types of volcano cakes, but the kind below is a basic model that's likely to turn out well every time. It's always possible to tweak baking and design instructions to your own preferences, so once you've made the cake once or twice, don't be afraid to put your own spin on it and let your creativity come into play. To make a volcano cake, you'll need a few pieces of specialty cake decorating supplies like a Bundt pan or an oven-safe bowl. The Bundt cake by itself can serve as the volcano, but you also have the option of baking your cake in a domed pan or a bowl (Pyrex bowls and other oven-safe bowls work well). To make a triple-stacked volcano cake that will serve many people, you can use a Bundt cake as a base, a domed cake as a center layer and an upside-down cupcake for the top. Although it's not necessary, a flat spatula makes it easier and neater to spread frosting on the cake, and piping bags with round frosting tips can make it simpler to add bright icing to the sides of the cake. A standard box of cake mix will make enough batter to fit into a Bundt pan or medium-sized Pyrex bowl, but of course, you can also make batter from scratch. A volcano cake will work with any flavor of batter, but chocolate or red velvet are natural choices because the cake has chocolate frosting, and the dark tint of the cake is a good approximation of the blackened landscape among many real volcanoes. If you've made multiple cakes, put the Bundt cake on the bottom, the bowl cake in the middle, and the upside-down cupcake on top. You can also stack two bowl cakes on top of each other and cut away the sides so the cake slopes upward at a steep angle. Stick multiple cakes together with thick dabs of buttercream frosting. Cut a hole in the top of the cake. The hole should be about the size of a golf ball. Freeze the assembled cake for 20 to 30 minutes or until it is firm. Remove the cake from the freezer, brush it free of crumbs, and apply icing to the cake. Place it on a turntable if possible; if not, use a platter or a large plate that you can turn yourself. Using your flat spatula or a butter knife, place scoops of chocolate frosting on the cake and spread them to form a smooth surface. Return the cake to the freezer for 15 to 20 minutes or until the frosting has firmed. Tint 1/3 of the vanilla frosting red, 1/3 of the frosting orange, and 1/3 yellow. Load one color of frosting into your piping bag, fitted with a round frosting tip, or into a zip-top plastic bag with a small hole cut into the corner. Pipe the frosting down the sides of the volcano in messy waves. Repeat with the remaining two colors of frosting; you may have more frosting than you need to use. Mix up the candy "explosion" decorations. Combine the sugar, corn syrup, and water in a saucepan, and heat the liquid until it reaches 295 degrees. If you don't have a candy thermometer with which to gauge the temperature, simply keep cooking the liquid for five to 10 minutes before turning off the heat. Stir in a few drops of red food coloring, and allow the liquid to cool for a couple of minutes. When it's still warm, pour it into shapes on a foil- or parchment-lined cookie sheet. Refrigerate the lava swirls for 15 to 30 minutes or until they're firm enough to handle. Carefully place them on the outside of the cake. To finish, spread whipped cream into the center crevice of the cake if desired. 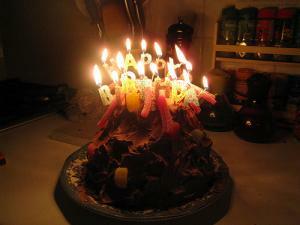 You could also make the cake steam with dry ice in a candleholder. 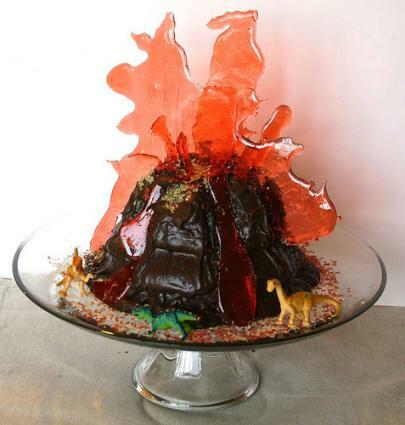 The volcano cake is a great addition to any tropical party or as a unique cake design for anyone who is fascinated with volcanoes. Learning how to make one is a fun project for decorators of any skill level.